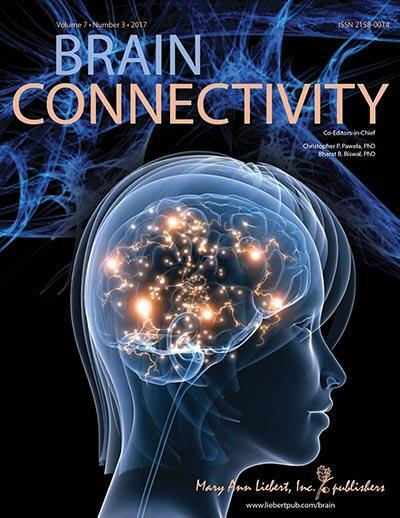 New Rochelle, NY, November 30, 2017–A new study in adolescent and young adult males with autism spectrum disorder (ASD) showed significant differences in the functional architecture and interactivity of the default mode network (DMN)–brain regions linked to social-cognitive impairment in ASD–compared to DMN functional connectivity measurements in young adult males without ASD. These findings, which could lead to the development of new imaging-based diagnostic markers, are described in an article published in Brain Connectivity, a peer-reviewed journal from Mary Ann Liebert, Inc., publishers. The article is available free on the Brain Connectivity website until December 31, 2017. Gagan Joshi, MD and colleagues from Massachusetts General Hospital (Boston), Harvard Medical School (Boston), Massachusetts Institute of Technology (Cambridge), and Johns Hopkins University (Baltimore, MD) coauthored the article entitled "Integration and Segregation of Default Mode Network Resting-State Functional Connectivity in Transition-Age Males with High-Functioning Autism Spectrum Disorder: A Proof-of-Concept Study." The researchers used resting-state functional magnetic resonance imaging (fMRI) to assess and compare the resting-state functional connectivity of the DMN in the two groups of teen and young adult males. The authors report multiple important differences between the groups, including significant reductions in the strength of intra-DMN coupling in ASD, polarity reversal, and differences in the strength of intra- and extra-DMN functional connectivity based on pattern recognition analysis. "This study by Dr. Joshi and colleagues adds to a growing body of literature detailing altered brain connections in individuals with autism," states Christopher Pawela, PhD, Editor-in-Chief of Brain Connectivity and Assistant Professor, Medical College of Wisconsin. "Autism is presently clinically diagnosed symptomatically, which can be very difficult. These researchers hope to build a series of imaging biomarkers that could bring clarity to the autism diagnosis process and help with treatment selection." Research reported in this publication was supported by the National Institute of Mental Health under Award Number K23MH100450. The content is solely the responsibility of the authors and does not necessarily represent the official views of the National Institutes of Health.